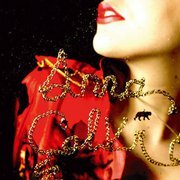 Anna Calvi, the name, sounds like a premium luxury brand, a perfume, a scarf, a handbag. Anna Calvi, the singer-songwriter, sounds like a Southern Gothic desperado of a guitar-heroine with a powerful, haunted and evocative voice. Italian musician names can be very misleading, especially for women, it's hard to sort them out just by name : Nina Nastasia, Cecilia Bartolli, Lisa Germano, Gabriella Cilmi, Emiliana Torrini, Laura Pausini, they could all be opera singers, or the Italian girl-next-door, because everybody got one, and some could be pornstars, but rock musicians? Dunno. Well, Anna Calvi is obviously one, and after Marnie Stern, we got another guitar virtuoso on our hands, like Marnie Stern, she brings a different approach and genuine sound to her instrument. "That pursuit of difference is clear in her live performances, where you can see her distinctive, circular playing style – half picking and half strumming – up close. She adopted the technique, she says, to make her guitar sound like 'a piano going up and down'" (1). The sounds she's creating with her Fender Telecaster are very varied and already her own, always a warm and broad sound, haunting and atmospheric. The album opens with the instrumental "Rider To The Sea" and that guitar coming out of a dark western, somewhere between Sergio Leone and Quentin Tarantino, whose soundtrack would be played by the son of Ry Cooder and Tom Verlaine. Yeah, the father-to- son-thing is easy but sometimes funny. Tom Verlaine's guitar sound is maybe the most encountered reminiscence on this album, but then a more relaxed and warmer Tom. For the rest, it's pretty hard to pigeonhole that peculiar sound of her, there are elements of surf music, flamenco, jazz, blues of course, all in all very few British influences. Anna Calvi is a Londoner and maybe here lies a reason for her to be very often compared to PJ Harvey; they both don't really sound English, besides they're both driven by lust and passion which brings an intensely romantic nature to their songs. Listening to that album, it's no surprise Nick Cave himself requested her presence to open the last Grinderman's gigs around Europe, he must have find something of the lascivious and heroic PJ Harvey circa "To Bring You My Love" in Anna Calvi, the later being more respectable, less femme fatale but not less seductive. Anna Calvi is a self-thaught guitarist, I thought such musicians didn't exist anymore, and learned by listening to Django Reinhardt, among others. The same for her vocals, but way later, and by listening to Edith Piaf and Nina Simone (1). Anna Calvi's very first single was the song "Jezebel" (not on the album), a song originally written by Wayne Shanklin, but made famous by French chanteuse Edith Piaf. All these doesn't seem very rock'n'roll, however the album contains its share of electricity and energy, but somewhere closer to Nick Cave and The Bad Seeds during the eighties, minus their auto destructive and decadent behaviours. Anna Calvi is a lady and she has been invited to several fashion designers showcases, Karl Lagerfeld is a fan (2) and Brian Eno became her unofficial mentor (3). Whatever the hype, there's something going on with that very talented singer/songwriter and guitarist and it's extremely refreshing to discover a young English artist completely oblivious to whatever trends, it's a tour de force knowing she's living in such a fashion soaked cosmopolitan town as London. Definitely a very fine debut album, for the attention to details, the wide variety and coherence of styles, the seductive and intricate melodies evoking a movie yet to be made, a dark, sad and heroic one, some gothic western, something like Jim Jarmusch' "Dead Man", the guitar, the voice, the everything. The weakest song could be the ninth one "Morning Light", quite forgettable, but it's hugely compensated by the standout sixth (such a coincidence!) track "The Devil", a gem, a little tour-de-force with it's sparse narrative guitar and inhabitated vocals shouting the title for the length of the song. Haunting. The shadow of Jeff Buckley is hiding in the corner.